Every year around the beginning of August my husband and I take our kids shopping for back to school. From backpacks and clothes to shoes and school supplies, it’s a fun time for them and it actually gets them a little excited about the coming new year. Some years are harder than others when it comes to purchasing these items, depending on our season of life or how much they’ve grown! But my kids have never, ever gone without. But I know for a fact there are kids in our community, kids my children go to school with, that have gone without new items for school. We do what we can here and there by donating backpacks and supplies and by volunteering time to our schools. It’s our community. These are our neighbors. We should be doing what we can to make sure every child has the opportunity to head back to school with clothes and shoes that fit, the supplies they need and a backpack to carry them in. Wouldn’t it be great to shop for your kiddos’ back to school shoes at a store who also fully understands this concept of community and giving back? A company who wants to do what they can to make sure every child walks into the front doors of their school with a little more confidence? I’m thrilled to share with you about Rack Room Shoes and the non-profit organization Shoes That Fit. Rack Room Shoes has partnered with Shoes That Fit, a national non-profit organization that provides shoes for disadvantaged kids. With your help Rack Room Shoes is raising funds this Back to School season to provide shoes to local school children in need. They want kids to start off the school year focusing on their studies, and not the fact that they’re wearing ill-fitting or damaged shoes. You know how great you feel when you get a new pair of shoes? Wouldn’t it be amazing for every kid in need to have the opportunity to feel like that as they head back to school? The funds raised by Rack Room Shoes through Shoes That Fit, stay in your community. The more money that is raised, the more resources that are made available to purchase shoes for students in your area. Donate $5 or more in-store to the Shoes That Fit campaign to benefit disadvantaged children in your local community. Or, donate here. Rack Room Shoes will donate 100% of the proceeds raised to a local Title 1 school in your community. 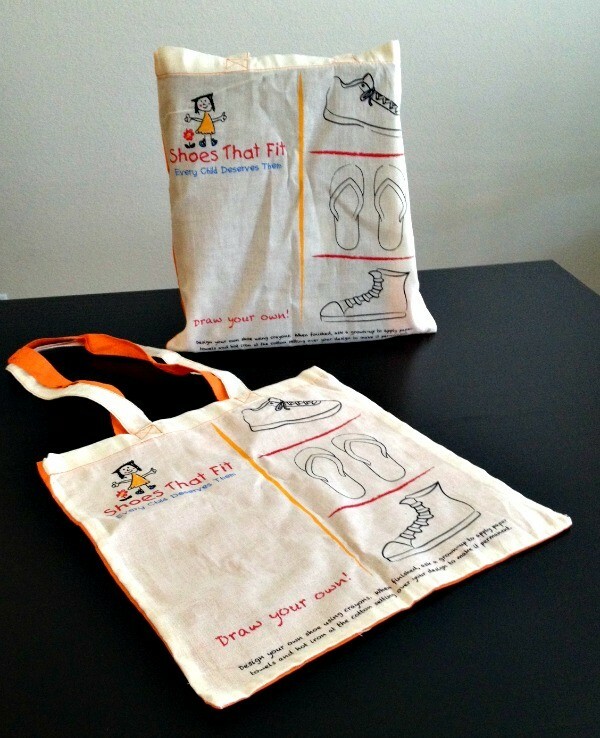 As you read above, you’ll receive a tote bag you can color with your children. I’m ready to color mine with my kids! This isn’t the first time Rack Room Shoes has done this. Last year they raised more than half a million dollars through the campaign. Let’s see if we can do even better than that this year?! Consider visiting your local Rack Room Shoes whether it’s for Back to School shopping, new shoes for yourself or just to donate. Or donate online. Disclosure: This is a sponsored post. I received Rack Room Shoes gift cards to facilitate my post and as a thank you for participating.